Taken in 1907 and donated by Linda Reid, British Columbia, Canada. J. Cawrey. (Trainer) J. Ball. (Captain) A. Herbert. A. Dexter. M. Spence. O. Sutton. (Reserve) H. Willmore. S. Rue. H. Holmes. A. Martin. C. Disney. J. Neal. T. Barwell. J. Booth. The J. Neal in the front row is James (Jim) 'Bang' Neal, who a year later was briefly a professional with Leicester Fosse. His only first-team experience turned out to be in an October 1908 friendly against Blackburn Rovers (played under floodlights at Peel Croft, Burton-on-Trent), but he was noted as a marksman for the club's Reserves (claiming a five-goal haul from one game against Chesterfield). 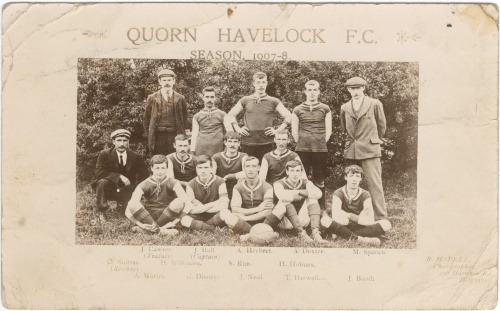 In summer 1909 he moved on to join Mansfield Wesley (Notts & Derbyshire League), but was a reinstated amateur back with Quorn Havelock in 1911, and with Mountsorrel United from 1912. After WW1 he played for Mountsorrel Town. His birth was registered in Mountsorrel, fourth quarter 1884. Both he and his brother John William (birth registered quarter 4 1886), were, (outside the game), stone quarry workers. Missing information: Can you supply any more information about this team? Submitted by: Linda Reid. Addional information from Paul Taylor and Patrick Neal.